Everyone on earth has a purpose for being here, but it can be difficult to discover. Luckily, each of us has a guru residing inside—a spiritual guide to lead us on the path to fulfillment. 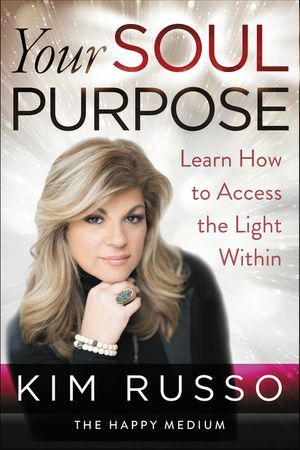 As “The Happy Medium,” Kim has reached beyond the realms of the known. Her gift allows her to sees what many of us cannot: that the world is filled with distractions and barriers that can derail us from living our lives with meaning and purpose. By explaining spiritual laws—including divine oneness, balance, vibration, and resistance—and providing practical, illuminating exercises, Kim unlocks our spiritual toolbox to help us reframe our world. Wise and compassionate, Kim teaches us how to embrace love, reject fear, and rid ourselves of negativity bias, through a series of helpful quizzes and assignments that make it easy to discover who we are. Your Soul Purpose will empower readers to recognize love, leave their fear and egos at the door, and use the spiritual tools they already possess to fulfill their destiny.